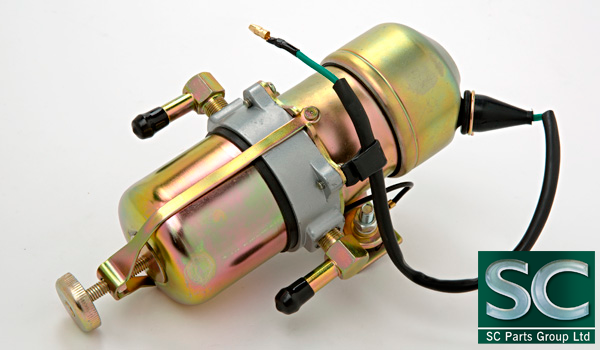 Our fuel pump - available again! our fuel pump is the solution for many problems around classic car fuel supply. As a self-regulating diaphragm pump, it is reliable and universally applicable. The perfect solution for all carburetor engines. From Adler to Zastava, or Alvis to Vauxhall. • For all carburettor engines with 12 Volt on-board voltage. Positive or negative ground. • The rate of delivery automatically adapts to the fuel requirement of the engine. • ...and it even makes the right typical English sound. Delivery rate approx. 90 litres/hour. Working pressure 0.3 bar. Dimensions about 17 x 6 cm, hose connectors 8 mm. These pumps are often used in competition vehicles. They are suitable for all carburettor engines up to about 3 litres capacity. High-capacity engines that cannot be supplied sufficiently by one pump can be operated very well with 2 fuel pumps connected in parallel. Filter cartridge with paper filter element for filtering the fuel. Easily accessible inside the pump, at the bottom. The metal edge ensures a secure fit of the filter element. Do not clean, replace at normal maintenance intervals. Slotted rubber sealing ring to seal the filter housing. Easily accessible. If dirty in the groove, replace as part of regular vehicle maintenance. Adapter for changing the diameter from 6 to 8 mm and vice versa. Solid metal construction. Toothed connector: The fuel hoses hold at low pressures at carburetor engines also without clamp. smaller version with 67mm diameter. Same pressure range, limited to 300 ltr./hour. To display the preset fuel pressure. The manometer is connected to the threaded connector of the fuel pressure regulator. The measuring range is from 0-1 bar, correspondingly (0-15 Psi). The pressure gauge should not remain mounted during driving because it acts as a reservoir and can have influence on real fuel pressure. Worm driven band hose clamps. Set of 115 stainless steel clamps from 8 to 28 mm, in sturdy plastic box. The right clamp for all applications, always at hand when working on the fuel supply.